It’s been quite awhile since I have visited the subject of choir. Recently I have had increased opportunities to speak/address the needs associated with participating in or leading a choir. As I travel around the world, my goal is always to encourage and help equip those I speak to. I want to help them to be able to accomplish their goals in all things having to do with music ministry. Since I last wrote an article about choir, I believe things have evolved somewhat and so I thought it might be time to revisit the subject. This article will be part one of a two-part series. A choir director is like a pastor– It’s very important to take advantage of the opportunity available to you as a choir director/ music minister/worship leader for truly loving your “flock”. A choir is very similar to a “mini-church” in that it is a body of believers set apart for a specific task. As a choir director you are the leader and therefore I am calling you a “pastor/shepherd”. Validate each and every person’s value and strengths-As a choir director, it’s important that you take the time to get to know each member well enough to understand their strengths and gifts. A choir member that feels important and necessary is much more likely to be committed and take the position of choir member seriously. The director needs to be prepared and upbeat-As the leader in this music ministry (as with any other) it’s important that you be good at what you do. You need to set the example of being prepared. Know your music. Be familiar enough with each of the individual parts that you can spot a wrong note when it’s sung. If you feel inadequate with regard to your training (which is so very common) then take some courses or study on your own to get better. Grow! I have always believed that most people truly don’t mind showing up for a rehearsal that is effective. What people mind is having their tine wasted. So make sure that you maximize your rehearsal time by being prepared and having a plan. Keep the rehearsals moving. Make sure people leave better off than they came. Most people want to do a great job, it’s your job to help them do just that. TEACH your choir-And while you’re at the business of growing as a director, take your choir along with you. Never forget the wonderful opportunity you have to help shape and grow your choir. You may not have a lot of extra time for this—in fact, you probably feel that you have none. But, let me assure you that EVERY minute you spend teaching your singers new skills will save you time in the future. You will be helping to fill their “vocal tool boxes” and once they’ve acquired these new skills they will be able to readily use them when you need them to. It’s way worth the investment of time. Take five minutes—FIVE MINUTES—each week to teach them something new. Perhaps you don’t feel that confident as a vocal instructor. You can at least share with them each week the things that YOU’VE been learning. I offer multiple resources on my website to help equip you as a vocalist if you are looking for some help. Choose GREAT music-I can’t emphasize this enough. When you are choosing music make sure that the songs you choose “grab” you within the first 10 seconds. Make sure that they are fun, exciting, beautiful, powerful, etc. You want to love the song so that you can teach it with enthusiasm. 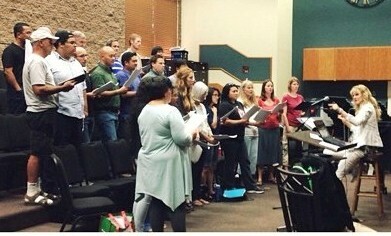 You want your CHOIR to love the song so that they can SING it with enthusiasm. And lastly you want your congregation to be able to connect immediately with the song so that they can truly have a powerful experience. Require respect for the director-One of the most difficult things about working with a church choir is that although you are in authority by virtue of your position, you are working with your friends and peers. This creates for an interesting dynamic. In school choirs, the students are led by teachers who are in authority over them and give them a grade at the end of the semester. In professional choirs the members are chosen and/or hired by a professional that is clearly in authority and in fact may be in charge of your paycheck. There is rarely any fraternizing between director and choir members in most of these situations. In a church choir however, it’s completely different. Your choir members may be in other positions of authority over you—for example, I have always had the privilege of having my pastor be in my choir. Three different churches that I served as music minister in all had pastors that loved to sing (and were good at it!). Your choir members may be filled with your close friends (mine always have been). I even had my older brother (who was a great singer and way more talented musically than I ever will be AND with more experience in better choirs than I had!) in my first church choir. These types of situations can make it difficult for you to lead in a truly effective way. It can even contribute to losing complete control at any given time. But it is essential that you take and maintain control as much as possible. Take authority and realize that everyone will benefit when you do. Make it clear from the beginning who is in charge and what the rules are. Then do your best to follow through. This will help to make your time together enjoyable for everyone and highly effective. Next time I will get into more of the nuts and bolts of how to work with your choir to make them the best that they can be and to be a total blessing to God, you and your congregation. Until next time! My husband, Keith, has recently taken a pastorate at Central Chapel in Hedgesville, WV. He is evaluating all avenues of ministry right now, one area he has found that needs tweaking is the music. They are open to praise music and have 2-3 songs included but also 2-3 songs of traditional every Sunday. As of right now they have no guidelines and he would like to put something in writing for them all to read and use. Can you recommend some good books for us to read that might help us with a balance of these? (or do you have some articles you have written that would help? )Keith and I have a good concept of this but need some help from others on this subject. Hey Brenda, I would recommend two books by Bob Sorge :EXPLORING WORSHIP and FOLLOWING THE RIVER. They are great books for any worshiper or worship leader to read!